Your home is the place where you and your family go to feel safe. After a long day at work or out running errands, it is relaxing to come home and settle in for dinner and bed. However, for you to get through your day and check all of the tasks off of your to-do list, you need all of the systems in your home to be working properly. This is especially true for your plumbing system. In fact, if you have a main sewer line failure, none of the plumbing fixtures in your home will work properly. When you’re dealing with a sewer line malfunction or failure – don’t leave anything to chance! 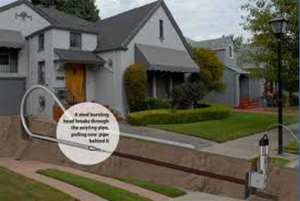 Call The Trenchless Guys as soon as possible so that we can assess your situation and give you the up-front pricing you need to make an informed decision. What Are The Benefits Of A Trenchless Approach To Sewer Line Repair? In the past, the only way to repair a sewer line failure was to bring in heavy equipment like backhoes and excavators that would dig giant trenches through your landscaping, driveway, and patio to locate the problem. As you can imagine, this process took a lot of time … and money. Not to mention the cleanup that the homeowner was responsible for once the sewer line was fully repaired. Thankfully, plumbing technology has advanced and there is now a better option! The Trenchless Guys of Zanesville have dedicated their careers to learning the specialized techniques and equipment required to provide trenchless sewer pipe bursting and expert relining. Pipe bursting: This method works great for sewer lines that are completely damaged with no chance of repair. This can happen for a number of reasons like tree roots or if a pipe bellies due to a shift in the soil. Pipe bursting is the process of breaking the damaged pipe into small pieces while simultaneously running a new section of pipe in its place. Pipe relining: If a section of pipe is able to be repaired, rather than replaced, then pipe relining is a great option. When The Trenchless Guys provide pipe relining, we will run a piece of material inside of the damaged pipe. Then, we use a balloon tool to inflate the material inside of the pipe. The material will press against the inside walls of the damaged pipe and adhere to form a secure seal. This provides a brand new lining on the inside of the pipes and, in most cases, leaves the pipes even more secure than they were originally. If you are facing the stress and disruption of a sewer line failure, call The Trenchless Guys as soon as possible! Our team has more than 20 years experience in the plumbing field and we are uniquely-qualified to provide trenchless sewer pipe bursting and expert relining. As a family-owned and operated business, we are committed to providing the best customer care and trenchless service to our clients.